Please login to your school email id i.e. p.firstname.lastname. @fountainheadschools.org (e.g. p.bharat.shah@fountainheadschools.org ) to view these forms. To confirm, click on “Process“. After getting the payment confirmation, the coupons will be handed over to your child in a sealed envelope within 3 working days and confirmation will be sent to the parent through communication diary. In case of refund money for canceled/failed payments; the school will not be responsible for the same. Parent has to contact Paytm support directly. Current students and alumni of Fountainhead School can request for the following certificates/transcripts based on their requirement. Fee: It will be charged according to the documents requested by the student as per the table is given below. The Report card is chargeable as it is already sent to you at the end of the year through email and as it is an important document it is expected to be kept safe. The payment for the report card has to be made through Paytm. The instructions for the same are given below in the “Alumni” payment section. The charges mentioned above are for single copy only, except transcript. This means it will be charged separately the number of times you apply for it. For e.g. If a parent requests for character certificate in the month of January and then again in the month of March then they will have to pay the amount twice. If a Grade 12 parent requests for report cards from Grade 7 to Grade 12 then they need to pay Rs. 3000/- (500*6=3000). Condition a. (mentioned above) will also be applicable in this case. After the payment is made (incase of report card for current students and for Alumni), the parent has to send the transaction id at surat@fountainheadschools.org which will be sent to the accounts department for verification. Document will be given in 2 days after the payment is confirmed. Alumni – The payment has to be made through Paytm. The instructions for the same are given below. 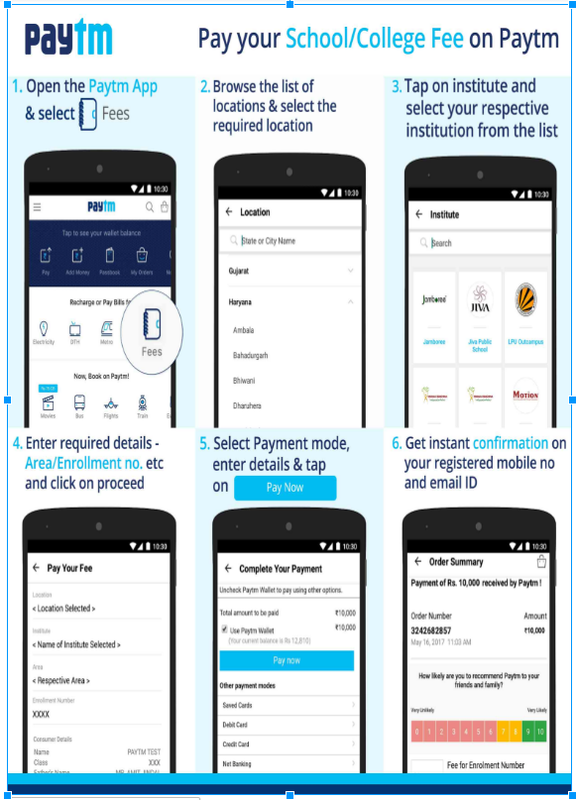 Banking: No convenience fee will be charged when you pay your fee with Paytm. Pick your payment option. ‘Pay now’ with your Paytm wallet/Debit card/Credit card/ Net banking. You will receive a payment confirmation form Paytm on your registered mobile no. and email id. Note: Now pay your Fee through Paytm at zero convenience Fee.